Riverside Lifestyle Estates™ will be way more than condo buildings beside a golf course, along a beautiful river in the picturesque Assiniboine Valley. It will be a thriving, vibrant community with all that life has to offer! 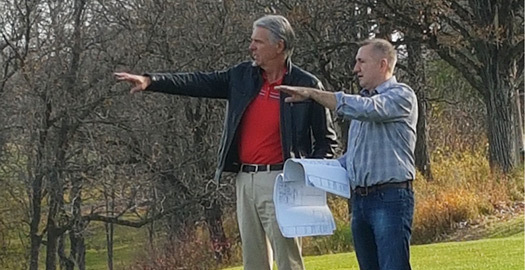 Rod Lindenberg and Kelvin Orr of Horizon Builders™ are the visionaries who developed the plan for this unique lifestyle opportunity. They are thrilled to have been awarded the right to purchase the land by the Wheat City Golf Course from the City of Brandon. This spectacular location on the Assiniboine River, along the western edge of Brandon is a peaceful oasis with enchanting views of the city and country. Rod and Kelvin's vision won the right to purchase the riverside area. They plan to create an amenity-enhanced, multi-recreational residential community for people who want more out of life. Living well can be more than a dream. "Anytime you can turn a dream into reality, it's a special thing," said Kelvin Orr. Horizon Builders is known for its quality and ingenuity in building. Riverside Lifestyle Estates™ is a special, large scale project. To ensure a successful venture, Horizon Builders has formed a larger group of partners to create SKYline Developments™. SKYline Developments™ will provide the diverse expertise necessary to fully complete the vision of a lifestyle community with doorstep access to a variety of recreational activities and commercial venues. Rod, Kelvin and the SKYline Developments™ group are honored to have a great working relationship with the city of Brandon. They realize that more often than not, some details take longer than originally planned. For a development of this size, that is to be expected. "We had certainly hoped to be in full selling mode by now" explains Rod Lindenberg "We know the city is excited about the vision for Riverside Lifestyle Estates™ we are wanting to create. Riverside Lifestyle Estates™ with the help of Ted and Aubrey at Sutton, are currently positioning a Letter of Intent option to prospective buyers. This allows buyers to be the first to secure the suite of their choice in a non-binding agreement. They feel this is a great tool that allows them to share their vision with the general public while at the same time garnering interest and feedback on the development. During this time, the Riverside plans are being finalized and once completed, they'll be moving forward with submitting the plans for full subdivision and re zoning with the City Of Brandon. They anticipate this process to be completed in or around the month of April. Based on this, they hope to have final stamp of approval on the subdivision plan from the city of Brandon on or around the month of May (or earlier if possible) which then will allow them to proceed to convert our non-binding Letter of Intents to pre-sale agreements. Once they achieve approximately 60% of our first 44 unit building pre sold under pre sale agreements, they will proceed with beginning construction. The goals are to be digging in the fall (or sooner) once they hit their pre-sale targets and their anticipated completion date would be approximately 18 months from that point. In the event it takes a little longer to achieve the pre-sale targets, the timeline will be adjusted accordingly. This development is so exciting, not only for Brandon but all of Manitoba. We look forward to giving you the lifestyle option you deserve and will do everything within our power to meet or exceed the timeline expectations. However, having said that, there are many things that remain out of our control which may alter the anticipated timelines we have noted. Our commitment to you will be transparency as we work together on this exciting journey. Watch the website for further updates! An architect's rendering of Riverside Lifestyle EstatesTM. The view is taken from halfway down the number 1 fairway looking back towards the 1st tee of box to the south east.